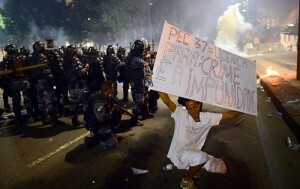 RIO DE JANEIRO, BRAZIL – The Rio Secretary of Conservation and Public Services, Marcos Belchior, announced that damages in the Centro area from last Thursday’s (June 20th) protests will cost up to R$1.5 million due to vandalism. For some this sounded like government rationalization for the heavy police presence and violence in some cases. Police violence escalated at protests last Thursday, photo by Semilla Luz/Flickr Creative Commons License. An estimated 300,000 protested on Rio’s Rua Presidente Vargas in Centro against corruption, poor services, and other issues in the massive protest movement across Brazil this month. Accounts describe the demonstrations as generally peaceful, but there are plenty of incidents of vandalism documented on video images as well. According to the government, the worst damage was done to traffic signals and radars, which represent 53 percent – or R$800,000 – of the total damage costs. Significant damage was done to 62 bus shelters as well, which will be repaired by the privately owned entities which have contracts with the city government. Buildings and structures such as the Sambódromo, the Terreirão do Samba, the post office, the Police Command and Control Center of Rio, and the Praça Onze metro station, along with smaller shops and restaurants also experienced vandalism. Many stores in Centro, Ipanema, Copacabana, Leblon and Barra da Tijuca closed early on Friday in fear of more looting and destruction. Damages were apparently avoided with the exception of a car dealership in Barra where a group broke in and vandalized 45 vehicles. Protests on Thursday drew 7,500 police officers on duty, photo by Semilla Luz/Flickr Creative Commons License. “Acts of vandalism will not be tolerated,” said Rio state governor Sergio Cabral on Friday in reaction. There has however, been controversy over the 7,500 armed police units the city sent to control the protests on June 20th. The police used tear gas, pepper spray, rubber bullets, and other riot control methods. The situation quickly turned violent as the night went on and many peaceful protesters and even non-participating citizens were injured. “The accusation of vandalism in this legitimate movement is unscrupulous government officials and Brazilian elite trying to manipulate the public opinion. But they suffer a huge setback, because clear research demonstrates enormous popular support for the manifestations repudiation of coercion and police violence,” said PSOL (Party of Socialism and Liberty) city councilman Eliomar Coelho in a statement. Susana Duarte Brandão, a Carioca and graduate student in Rio, had to take shelter from tear gas bombs being thrown in the street, and along with two friends took cover in a local bar when a bomb came flying through the door. “The air was burning, there was lots of gas. We had to open the doors and resort to vinegar [to alleviate pain of the tear gas],” she described to The Rio Times. “We started to walk on Aterro do Flamengo, I had imagined we were going to walk home when the shouting started, tanks!… coming up behind us… with no vandals in sight. 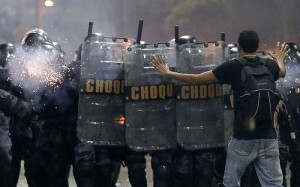 I ran, I ran fast, I have never had a panic like that, in fear that I was going to take a rubber bullet,” Brandão said. “The accusation of vandalism in this legitimate movement is unscrupulous government officials and Brazilian elite trying to manipulate the public opinion. But they suffer a huge setback, because clear research demonstrates enormous popular support for the manifestations repudiation of coercion and police violence”.